↑ 3.0 3.1 3.2 3.3 3.4 3.5 Moore K. L., Dalley A. F. Clinically Oriented Anatomy. 4th ed., 1997. ↑ 4.0 4.1 มีชัย ศรีใส และคณะ. มหกายวิภาคศาสตร์ประยุกต์ เล่มที่ 2: ศีรษะและคอ. พิมพ์ครั้งที่ 3. เยียร์บุ๊คพับลิชเชอร์, 2541. ↑ 10.0 10.1 10.2 Moore K. L., Persaud T. V. N., The Developing Human: Clinically Oriented Embryology, 6th ed., 1998. ↑ Sabbatini R.M.E. 1997. 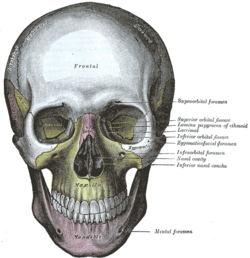 "Phrenology: the History of Brain Localization." Brain & Mind online. ↑ Sabbatini R.M.E. 1997. "Why Gall was right and wrong." Brain & Mind online. ↑ Sabbatini R.M.E. 1997. "Modern Phrenology." Brain & Mind online. ↑ Wohl A. S., van Wyhe J. 2004. 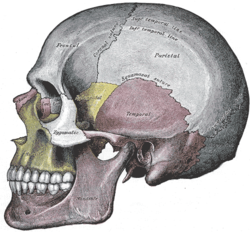 "Phrenology and Race in Nineteenth-Century Britain." Victorian Web. Clinically Oriented Anatomy, 5th ed. Keith L. Moore and Arthur F. Dalley. หน้านี้แก้ไขล่าสุดเมื่อวันที่ 8 มีนาคม 2556 เวลา 02:09 น.